As we’ve seen in the past, working with brands like OKA and Amara, customers absolutely love to talk about interior design – and that’s what makes word-of-mouth marketing an absolute no-brainer. Which is why we’re delighted to welcome Heal’s into the fold, as they launch their very first referral programme – powered, of course, by our award-winning technology. Essentially, we’re turning the conversations which already happen (“Where did you get those chairs? They’re amazing!” “I got them from Heal’s – I love their stuff.”) into direct digital calls-to-action. Because that’s the problem with organic word-of-mouth: there’s never a buy button when you need one. Our refer-a-friend platform solves that, giving existing brand fans the incentive and platform to go out and actively recruit their friends and family. It’s a simple scheme. Every time a customer successfully introduces a friend, they’ll get £25 of store credit, while their friend will be incentivised to shop via a 10% saving. 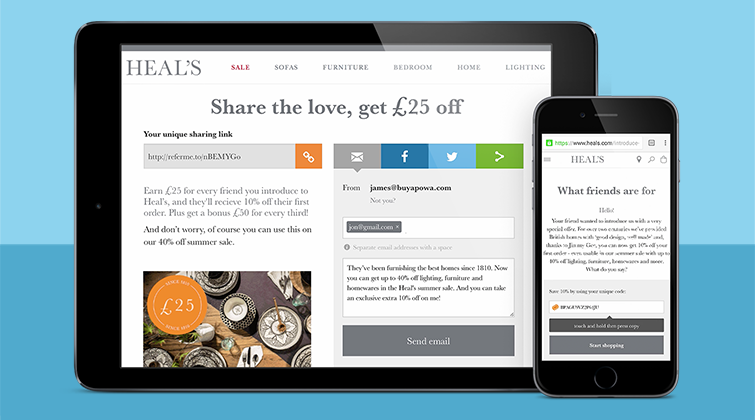 But Heal’s want to encourage their customers to refer multiple friends apiece, so they’re using Buyapowa’s cutting-edge tiered rewards feature to offer existing customers a bonus £50 for every third new customer they introduce. After all: when the products are this good, there’s no end to the number of friends you can get shopping. To see and join Heals’s exciting new programme, just click here. If you’d like to learn more about referral marketing, we’d love to hear from you.